Since becoming a cake decorator I have developed a slight obsession with cake stands which has in recent times surpassed that of my love of a good handbag. Rather than hiding handbags, I now retort ‘Oh, that old cake stand!’ if my husband remarks on a new one. The majority of my stands have been purchased on the online treasure trove that is Borrowed Blue Boutique. Stocking a range of gorgeous items for food, drink and party styling as well as gift ideas, it is hard to visit the site without purchasing a new prop or decoration. Through my purchases I have had the pleasure of becoming acquainted with the site’s owner, Katharine, who has always ensured that my orders arrive safely and punctually while keeping me up to date with any exciting new additions to the catalogue. Unsurprisingly, I responded with great delight when Katharine recently approached me to collaborate with her in designing a cake to complement a new stand in her range, the ‘Gloriette’. 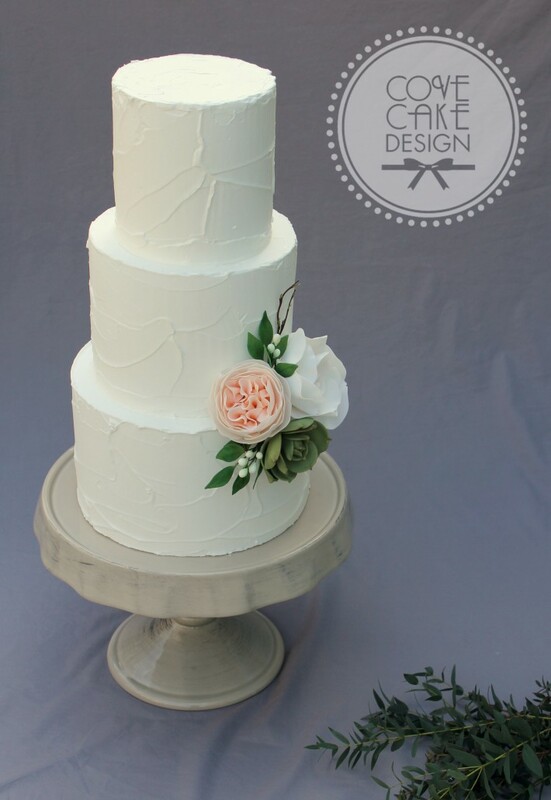 This large elegant ceramic stand has a pretty fluted skirt and is finished in a creamy French grey hue. While it looked fabulous in the catalogue photo it was only when I unwrapped it that could I really appreciate its weighty beauty. 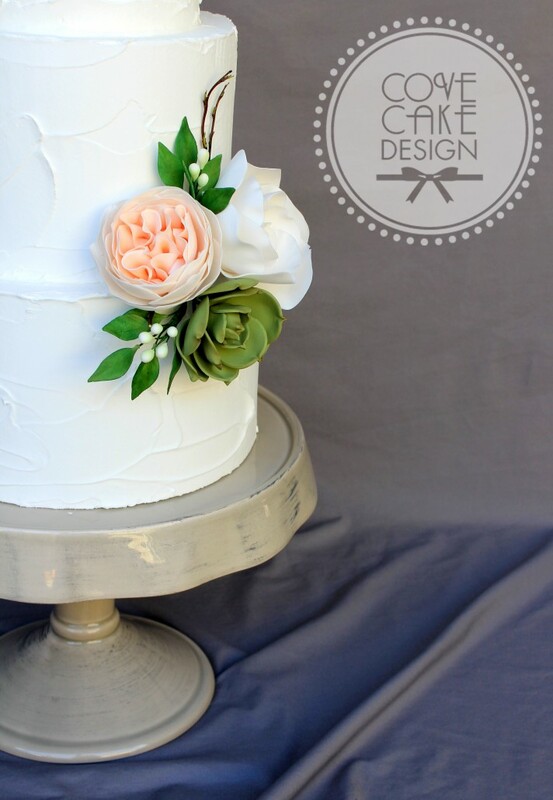 I wanted to design something that would complement its earthy and natural feel and decided on a rough white iced cake and sugar flowers inspired by a rustic peach, white and green bouquet (Image courtesy of Style Me Pretty). I selected an old English Tea Rose in peach, a white oversized Rose and my first sugar Succulent. I have a new love for the latter…expect to see more of these varied and unusual beauties! The Gloriette, like all of my stands, is of course available for hire and I am looking forward to creating more cakes suited to its pretty yet earthy style. 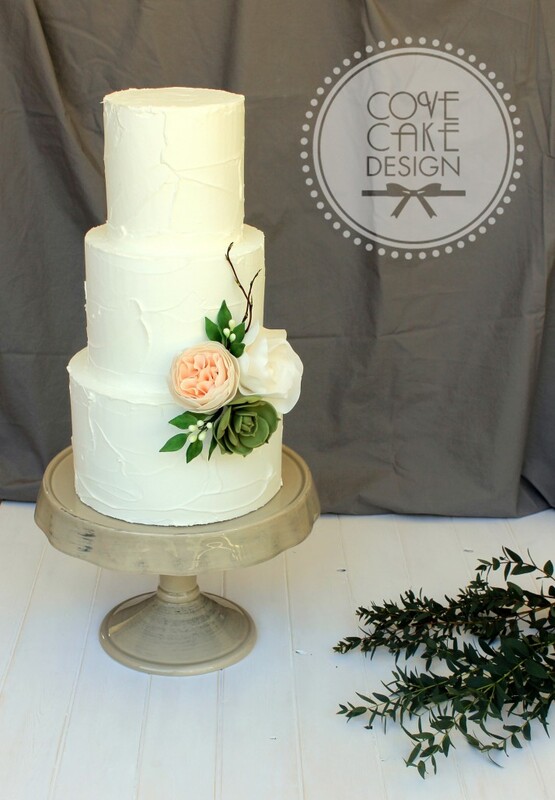 Don’t forget to pay a visit to Borrowed Blue Boutique for cake stands and more! 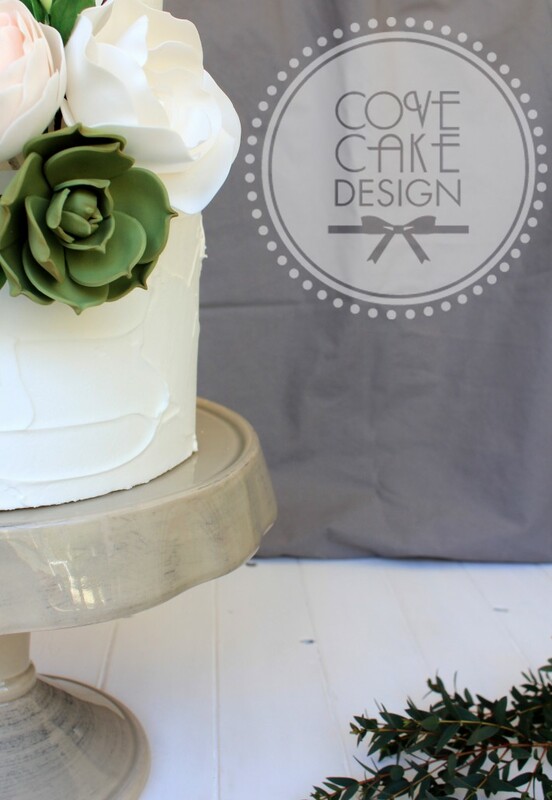 Love this stand and your beautiful cake! That English rose is so incredibly paper thin, I don’t know how you do it!